The elegant 4 star Rose Bay Hotel is a member of G & E Karamolegos Group of Hotels SA. The hotel is just 50 meters from the endless black sandy beach of Kamari. Located on the peaceful side of the village, we consider your relaxation our priority and we offer you a cosy, tranquil and hospitable Santorini Hotel Resort. 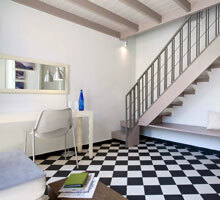 We combine the style and comfort of genuine 'A' class facilities with spacious premises and a Mediterranean aesthetic. We look forward to welcoming you for an unforgettable time in the mystical land of Santorini where breathtaking nature meets a civilization of ancient beauty and warm, hospitable people. Make your vacation a lifetime experience. 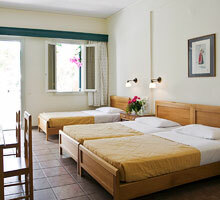 Choose from 55 comfortable single, double and triple rooms, including 6 Junior Suites suitable for families. 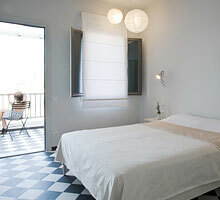 There are 2 rooms specially designed for physically challenged guests. Just click on the "CHECK AVAILABILITY" button, to see all current special offers. Get 20% off by prepaying the full amount of your reservation 60 days before arrival! Get 10% off by prepaying the full amount of your reservation 60 days before arrival! A valid credit card is required to secure your reservation (pre-authorization may be required). Full payment will be made directly to the Hotel at check out time.